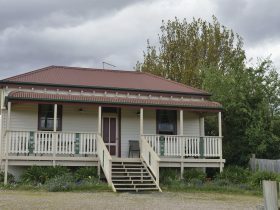 Bowerbank Mill B&B provides elegant bed and breakfast accommodation in Deloraine, Tasmania. The original flour mill (circa 1853) is nestled at the foot of the Western Tiers mountain range. 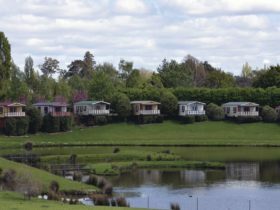 Choose from two unique and beautiful cottages. The Chimney Cottage is perfect for two, appointed with a queen-size bed, piano and cosy log fire. 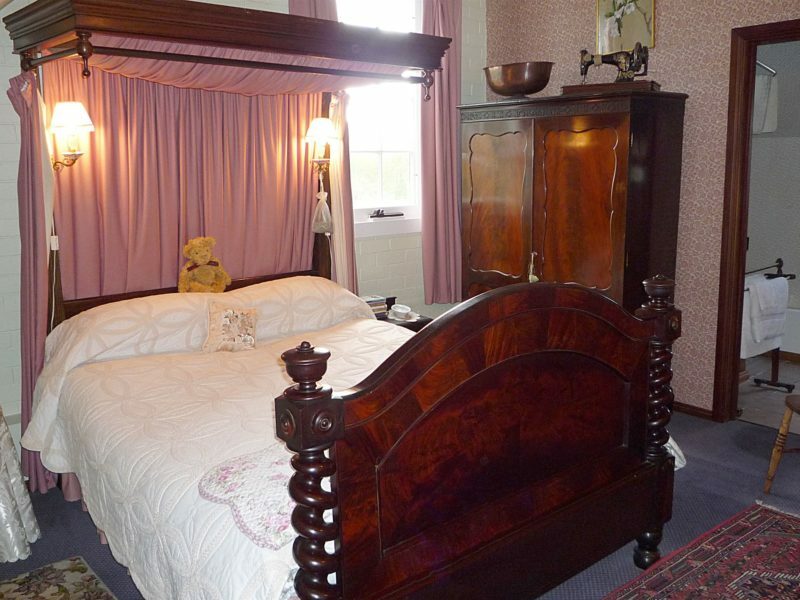 Meander Cottage has a queen-size bed and two single beds (suit 168cm), suitable for four guests. 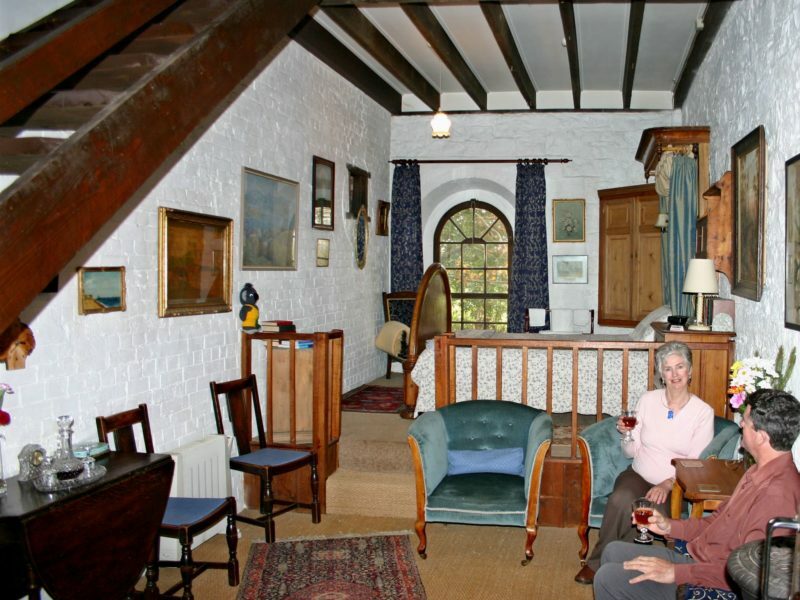 There is a kitchenette, living area and ensuite bathroom in both cottages. Relax as you are served a delicious breakfast and take time to look at works displayed in the Bowerbank Mill Fine Art Gallery and Gift Shop. 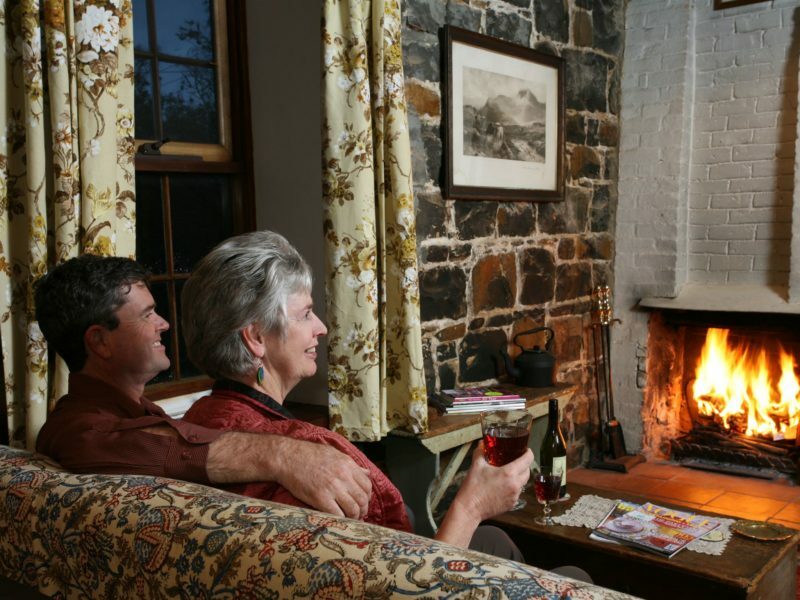 Plan a bush walk or simply relax in your surroundings. 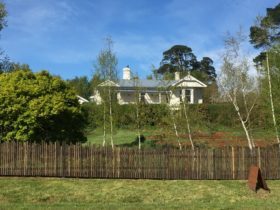 Bowerbank Mill B&B is approximately a thirty-five-minute drive from Launceston (50 km) and a 90-minute scenic drive to Cradle Mountain. Exclusively yours – for couples on a special time. Be greeted by fragrant cottage flower gardens retained in rock walls, paved paths and the awesome six storey chimney. Walk through antique arched doors into the ground floor that features exposed beams, natural blue stone walls, views over pastures and pretty gardens, kitchenette/dining area, lounge in front of the blazing log fire in that totally amazing chimney. Upstairs the alluring loft bedroom has a queen size half-tester bed, and bath/shower ensuite. Enjoy the genuine antiques and period curios, DVD library and off-street parking. Includes gourmet breakfast, homemade goodies (jams, etc), port and nibbles on arrival. After leaving the private car park, meander through the boxed hedges to the French door entrance. The kitchenette/dining area and comfortable sitting room create a warm welcome. Views through the arched window from the elegant queen half-tester bed display the pretty front garden and the leafy branches of the English oak tree. A staircase winds up to the ensuite bath/shower and the sweetest loft bedroom where teddy bears repose on the quaint Austrian sleigh beds (suit guests up to 168cms tall) that a 4-year-old guest wanted to take home with him. Cottage is not suitable for children between 7 months and 3 years old. DVD library and off-street parking. 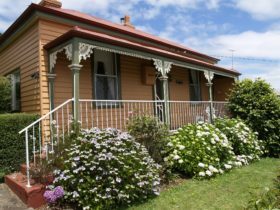 The accommodation includes gourmet breakfast with homemade goodies, port and nibbles on arrival. Two night minimum. 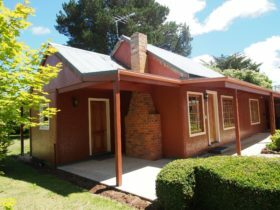 This newly renovated cottage is tucked away in a quiet street , Deloraine, with lovely views over picturesque rolling hills and the spectacular Great Western Tiers Mountain Range. Apart from the new stream-line kitchen the changes in style to the 60’s Cottage were minimal, keeping purity in the crisp, clean lines of the interior. Bright splashes of color enhance the neutral paint creating a stylish individuality. The eclectic furnishings and decor are enhanced by tasteful artwork, especially a black and white portrait of the goddess of the silver screen, Marilyn Monroe. 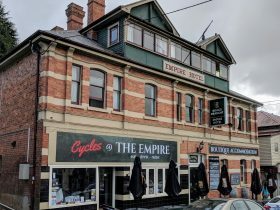 These little finishing touches make your stay a comfortable, memorable and unique Tassie experience. Plus there are more wonderful surprises.